Deeply clean and tone your skin with this old-fashioned face mask. The smell of cucumbers is obvious as soon as you open the lid. Lift, tighten, and firm the skin around your eyes in minutes for a youthful glow. Your skin will be drastically revitalized and radiant. Simply mix with water or milk to create a thick paste and apply on face and neck. Leave 1 to 15 minutes minimum and rinse. 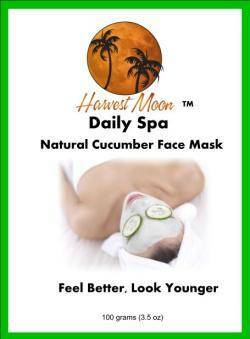 If skin is dry after use use Harvest Moon Almond Saffron lotion or Harvest Moon Anti-Wrinkle Cream.